The decision to put a new roof on your home is a big one and represents a sizable investment. But knowing when it’s time to re-roof isn’t always clear. The following are some things to take into consideration when deciding whether a roof replacement makes more sense for you and your home. A quality roof installed by an exceptional roofing contractor will last many years. A shingle roof should last a Florida homeowner for 20 to 25 years, for example. 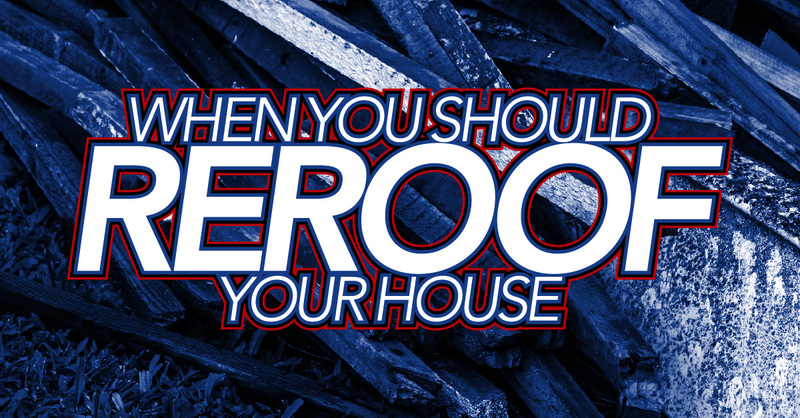 But, like anything, your roof begins to deteriorate as it ages. Age helps determine whether it’s time for a new roof or not. The type of material used to construct a roof is an important factor in its longevity. An asphalt or fiberglass shingle roof should last at least 20 years, while a metal roof can last 50 years or more. Some roof damage is more severe than other types, such as damage a roof may sustain during harsh weather. In some cases, the damage is so extensive you need to replace your roof. What are some signs which indicate a new roof may be in order? Water leaks don’t necessarily mean it’s time for a new roof. Routine repairs, such as repairing your roof’s shingles and flashing, can stop water leaks without further issues. When water leaks cause significant damage, regular repair work may not fix the problem. A droopy or sagging roof could mean damage caused by rot. In many cases, a roof replacement is your best option for preventing further damage. While damaged shingles don’t always signal it’s time for a roof replacement, curled and buckled shingles may be a sign of more significant damage. Even with consistent maintenance and regular inspections by a dependable roofing contractor, there may come a time when you’re spending more on roof repairs than ever before. At that point, a roof replacement is often more cost-effective in the long run. A trusted local roofer, such as Mark Kaufman Roofing of Sarasota, has the experience and integrity to help you decide if it’s time for a new roof on your home. Give us a call today to schedule a roof inspection.